Quick freebies post here for you - this was a recent offer in one of the daily newspapers. If you are expecting a new baby, or have recently popped one out, you might find good use in this freebie!! 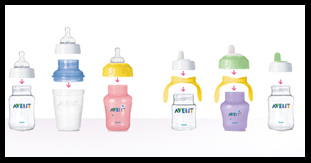 If you call Avent on 1-866-624-1906 (expired now), you can order your complimentary “BPA-free” sippy cups! They ask your name, address, phone number and kids’ ages. Getting free baby stuff is a great idea… they can be pretty expensive little bundles of joy!! If you’ve heard a lot about this BPA hullaballoo and aren’t sure what’s going on, have a read of the wiki page on it. P.S. Reports from other forums state that this freebie is a good one, and has been received by quite a few mommies! Number has been disconnected according to recorded message.